It’s been two years since Chicago’s Classic Cobbler moved out of its home-based digs and into a retail shop on the 200 block of the highly trafficked Dixie Highway. A specialty shop that encourages customers to call ahead and then come pick up their piping hot fruit cobblers on the way home from work, Classic Cobbler sells its products by the slice or serving or in dinner, family, and party sizes. Prices range from $4 a slice to $48.99 for a party-sized dish. The company also sells cakes and other baked goodies, but cobblers and pies make up its core business. Classic Cobbler has grown steadily since opening its doors in 2009, generating revenues of $105,000 in 2011 and a projected $200,000 for this year. Today the family-run business has its eye on a big prize–to outpace direct competitor Bakers Square, a 40-year-old bakery and restaurant located in the Great Lakes area. “Our long-term plan is to become the next Bakers Square,â€ saysÂ Bran’Arla Johnson, 51, managing partner, who founded the company with her mother, Bonnie Thompson, 71, also managing partner, and brother, Paul Glenn, 34, director of sales and marketing. 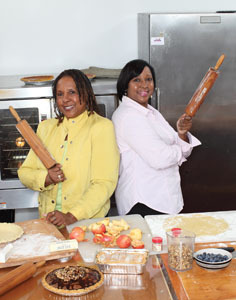 After baking for family events for years, the mother and daughter took their love of cooking to a professional level by opening Classic Cobbler. Working out of Thompson’s kitchen, they perfected a menu of fresh-baked pies before opening a retail location. During that “testâ€ phase, the two purchased mixers and other baking equipment. They funneled back into the business any profits they made that first year. When it came time to open their retail shop, the duo invested $60,000, using about $40,000 to build out or improve the shop; the rest covered the costs of a stove, refrigerator, freezer, and more mixers. Finding the right spot for Classic Cobbler was painstaking. Key criteria included an affordable lease rate, steady foot and vehicular traffic, and proximity to other eateries. (Classic Cobbler is a cafÃ© style store.) The owners began scouting for possibilities early in 2010.